Natural Born Leaders released its first EP About Time independently in May. There were nearly 5,000 entries to this year's Tiny Desk Contest. While NPR Music selected Los Angeles guitarist Naia Izumi as its 2018 winner this year, there were scores of contestants that impressed the judges with their music, their desks and for Asheville, N.C. band Natural Born Leaders, their convenience store. For the Tiny Convenience Store Concert, the band packed behind the ice cream freezer, just to left of the Slim Jims to play the original song "Abominable Creatures." "I was trying to stray away from the beer cooler," lead vocalist Mike Martinez jokes, though he says the store actually provided the perfect setting for a song that reckons with his experiences of his childhood in New Jersey. The convenience store as an institution was an ubiquitous constant across the suburban landscape of "Newark, New Jersey, Irvington, New Jersey, Elizabeth, New Jersey" that he grew up in. Martinez's lyrics grapple with growing up in the obscurity of the area, trying to seize his "one chance / to stand up to these wicked man-made plans" of racism, sexism, and every other -ism stacked against a young person's future. "I feel like I had no real direction in New Jersey. I've heard a lot of people talk about after coming to Asheville, they kind of felt like they had a purpose," Martinez says of the city he now calls home. Once in North Carolina, he got involved in the local music scene and started Natural Born Leaders. "Everything seems to be falling into place ever since I came down here." 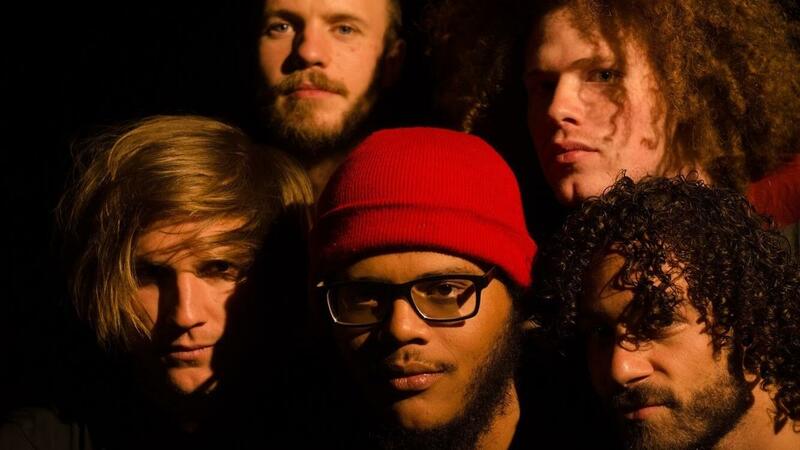 The song "Return of Jafar" off Natural Born Leaders' newest EP About Time speaks to the community Martinez found in Asheville. He took the song's chorus — "There ain't no power like the power of the people because the power of the people don't stop" — from a protest chant, thinking it'd be the perfect fit for a song that deals with war, racism and greed. Martinez says Asheville is the perfect place for music that approaches politics like this. "It's a huge music community and there's no nations and borders," he says. "Everybody's helping each other out ... [That's] the only reason why we're doing what we do right now." Nearly 5,000 entries to this year's Tiny Desk Contest - a lot of talented musicians and creative videos. NPR's music producers and judges sent us some of their favorites including this one by the Asheville, N.C., band Natural Born Leaders. NATURAL BORN LEADERS: (Singing) I wish I had a watch, just so I can watch the time fly by. Used to count the days by nights and drive-bys. But staring through the tears, only lone doves can cry. SIMON: It wasn't exactly a Tiny Desk Concert - more like a tiny convenience store concert. The band is packed behind the ice cream freezer just to the left of the Slim Jims. Lead vocalist Mike Martinez joins us now from Blue Ridge Public Radio in Asheville. Thanks so much for being with us. MIKE MARTINEZ: Hey, thank you so much for having us, Scott. SIMON: So did you stock up on Slurpees that day? MARTINEZ: (Laughter) Yeah, I was trying to stray away from the beer cooler. SIMON: What did - tell us about the song you're playing. In fact, let's listen to just a little more of "Abominable Creatures." NATURAL BORN LEADERS: (Singing) I always wonder how the gods became men. All these forgone things a man should never understand. Gritting my teeth, my hands stuck in quicksand and I stood up, got out of my dependence on circumstance. Get up, young blood. You only got one chance to stand up to these wicked man-made plans. I grew up on the new church block. Crips run that street carrying them sawed-off Glocks. SIMON: So was a convenience store a good backdrop for this song? MARTINEZ: Yeah, I think it fit the song perfectly. It reminded me a lot of my childhood. SIMON: Which is in New Jersey, right? SIMON: How did it remind you of your childhood? MARTINEZ: I spent a lot of time in and out of the convenience stores. I was a skateboarder when I was a teenager. So we'd always go in there for snacks and whatnot. And the song kind of is about a lot of - you know, me having a conversation with myself about what it was like to grow up in New Jersey. SIMON: To stand up to these wicked man-made plans? MARTINEZ: I feel like everything's a wicked man-made plan, you know - anything from racism to sexism to all the different -isms. SIMON: You also say Crips roam the street carrying them sawed-off Glocks. MARTINEZ: Yes, there is a big gang population in the area that I grew up in. I grew up near like Newark, N.J. I mean, aside from just gangs, there was mafia. SIMON: And how did you wind up in Asheville? MARTINEZ: These mountains came calling (laughter). A lot of my family ended up moving down here, which in turn was probably the best thing that's ever happened to my life. That's for sure. SIMON: Well, how did it change? MARTINEZ: I felt like I had no real direction in New Jersey. I've heard a lot of people talk about after coming to Asheville they kind of felt like they had a purpose. Once I came here, I feel like it was - you know, everything seems to be falling into place ever since I came down here. SIMON: Well, there's a new four-song EP out by Natural Born Leader. So let's listen to a bit of "Return Of Jafar." NATURAL BORN LEADERS: (Singing) Tear it down. Build it up. Make it better. We came to set the world free. Ain't no power like the power of the people because the power of the people don't stop. I said there ain't no power like the power of the people because the power of the people don't stop. SIMON: Where do you see the power of the people these days? MARTINEZ: This came from - me and my partner were at the Democratic National Convention last year at the protest to the convention. And the power of the people was kind of like a call and return. There ain't no power like the power of the people because the power of the people don't stop. I figured how fitting for, you know, a song that deals with such evil things like war and racism and the power structure of money and greed. SIMON: Do you put politics into your music because it's the times? Or is that one of the reasons why you want to make music? MARTINEZ: Politics is a huge part of everybody's life. It's definitely something that I spend a lot of time thinking about. I feel like nobody really has the right answers. But I do know that we're not doing it the right way. SIMON: Is Asheville a good place to make music? MARTINEZ: It is a fantastic place to make music. I think not many people in Asheville are necessarily making the kind of music that we make. But it's a huge music community, and there's no nations and borders. Everybody's helping each other out. SIMON: You know BJ Liederman, who writes our theme music on this show, is in Asheville. MARTINEZ: I did not know that. That's awesome though. SIMON: Well, you know, maybe the two of you will run into each other at one of the scores of music clubs that I know dot the area. MARTINEZ: I wouldn't be surprised if we haven't already ran into each other. SIMON: Mike Martinez, Tiny Desk Contest stand-out. Natural Born Leaders have just released their first studio EP called "About Time". Thanks so much. Good luck to you. MARTINEZ: Thank you so much for having me. (SOUNDBITE OF NATURAL BORN LEADERS SONG, "DO YOU MIND?") Transcript provided by NPR, Copyright NPR.